Did he point the nose up to loose speed. Stall, hoping for a minimal impact ? One look at the wreckage photo and it is evident that the non-survivable crash would leave little recognizable remains, and months in nature would leave no such traces. My husband's fate and story are so similar to Mr. Fossett's. As pilot and sole occupant of a borrowed general aviation aircraft, his plane slammed head on into a peak in Rocky Mountain National Park at 13,500 feet elevation. Covered in 20 feet of winter snow, the airplane was not found for 10 months at the end of the summer when all snow had melted. The final NTSB report indicated that the remains found was one small fragment of skull bone. He had survived unscathed through combat battle in Vietnam, being shot down in enemy territory, and through several emergency landings with engine failures. Yes, aviation is unforgiving. I am glad for Mrs. Fossett that the wreckage has been found. She can now stop searching, come to final terms with what has happened, and eventually, although sadly, move forward. It sure does seem that these things happen all the time. Some super duper acheiver gets complacent doing an ordinary thing (for them anyway) and THAT's the one that bites them. I am glad for his family that there is some sense of closure. I don't think he faked a death. I think it was mercy that his stuff was found for his family. We all have an appointed time to go, that was his and doing something he loved doing (flying). I'm impressed you were involved with search Miles. Miles, when flying into a box canyon, what likely happened? First, what happened to the ELT which is suppose to be in every aircraft, checked at annual, and working? Second, if Steve is, er was such a good and maticulous pilot, why did he not file a flight plan? Next, a Balinca still has all kinds of performance at 10, 000 MSL. With his experience he could have easily accomplished an emelman maneuver, basically a maximum performance climbing 180 degree turn that is taught to every pilot. To have the engine thrown 300 feet further up the mountian almost says he flew straight and level directly into the ground as it rose and at a precise altitude. One has to wonder how a set of sweats, his ID, and money got seperated from him, no reported blood or human remains stains therein. If he was killed or severely injured with life threatening injuries from such a crash surely there would be some sign of human remains attached to something. I have investigated to many aircraft accidents and no matter what else, in an accident where the cabin is comprimised, there are human remains someplace. Weather and time do not get rid of bones, hair, teeth, and other hard items. To me, unless they find his body or other DNA remains in the local area, something still sounds very funny. Time will tell. If you have investigated aircraft accidents, you know ELTs are very unreliable even if they survive the crash, and this was a bad crash. A Bellanca does NOT have all kinds of performance at 10,000', I flew aerobatics in one and to do an immelman, you have to have entry speed. If you have been trying to climb out of a situation, you don't have speed. The engine stayed where it hit, the rest of the plane went down the mountain side is my thought. And animals could easily have strewn his remains and clothing over the year, and it is early... too soon to say there aren't remains in the cabin, wherever that is from the pictures. Relax, tune down the imagination, let the investigators do their job. It is too early to start claiming the aliens got him. I am glad that his plane and remains were found. It is important for his family to have some closure after all this time. I am very surprised that with all his money, he did not have some tracking device on the plane. Dave, you really need to re-evaluate what you've written. First of all, the ELT could have been turned off...or it was malfunctioning, which we find all the time. You're right, though, they're supposed to be functioning correctly! Hmmm? You're knowledgeable of maneuvers he could have flown, but...face facts, if he had a heart attack–always in the back of one's mind–no matter how many flying maneuvers he was capable of doing, he might have been unable to do anything, especially if it was a massive one. The other thought is that he didn't care to do anything but to crash into the mountain, but that's a hard one to digest. As for the engine being 300' up the mountain, I dare say, the plane probably crashed at that altitude and the lighter plane body fell down to its final resting spot. As for the sweats, ID, and $$ being a quarter mile away, that–undoubtedly–might have been dragged there in his pants, when the animals were tearing him apart–Cougars, bears, and coyotes don't care where they eat, so long as they eat carrion; and looking at some of the pictures, he might have been toasted a little on impact, as well; thus, it would have really drawn a crowd of hungry animals, including high flying birds, etc. To find blood after thirteen months in a crash site is most difficult. And, as for your thought on human remains being "attached to something," definitely incorrect! Sorry about that, but you've got to get into a SAR unit and find out what this life is all about, so you can act, rather than just discuss your thoughts. We really need more volunteer members in all the counties, throughout the U.S. I'm not sure where you're coming from, but you indicated that you've "investigated too many aircraft accidents," so you must have some top notch knowledge going there, but...something definitely doesn't make sense, for maybe your accidents have been on the low lands or in the water. What you've written doesn't make much sense after a year or so of being out in this terrain. Your last comment is probably pretty much on the $$$, but it will take the searchers some time to see if they can find some bones, teeth, and maybe even some clothing besides his sweatshirt. But most clothing is taken away by animals and residing underground, so don't expect to find much there. As for the bones, they might be scattered over a quarter mile or even more, for that's how the animals do it. They want to be alone when they're dining. Not all dinner arrangements are like what you see on TV, such as lions eating their catch on National Geographic program. Time will tell and hopefully, the searchers have found and will find more and more remains of Steve Fossett. As for your final comment, I can guarantee you that they're not going to find his body, for the animals have dined on it! Something that hasn't come up, since the first discovery by the hiker–Sports store manager–is the fact that the mine that's fairly close by, hasn't been mentioned; thus, they might find more in there, if they'd look, and I'm sure they will. My opinion is that Fossett had a massive heart attack and slammed into that rocky mountain. He was too experienced a pilot and a licensed glider pilot to not have done an obvious evasive tactic even with a mechanical failure. Lots of ideas and theories out there. Glad he was found for the sake of his family. This evening, as of this writing, human remains have indeed been found at the crash site and are now undergoing DNA analysis for identification. There can be little doubt as to the impending results, and thankfully this will provide closure for Steve's family and friends. There are in fact many mitigating factors than can compromise safe mountain flying. These include adverse wind currents, sudden poor visibility in valleys, underestimating aircraft performance in high density-altitude conditions, and as Miles mentions, geographical disorientation resulting in unavoidable 'controlled flight into terrain'. Such is illustrated by a pilot inadvertently flying into a boxed canyon from which there is no safe exit either laterally or vertically, given a particular aircraft's performance spectrum. I believe, however, it is impossible to know what exactly happened to Steve's aircraft without more information from the NTSB. The crash location is apparently at the 10,000 ft level somewhere along a U-shaped mountain known as Volcanic Ridge. The possiblity exists that Steve initially entered the Minaret Creek valley at too low an initial altitude with the intention of crossing the narrow saddle between Ritter Peak and Volcanic Ridge (perhaps intending after wards to fly from south to north along the Ritter Range), but underestimated the Decathlon's climb performance in crossing the saddle and this high altitude. I do find it difficult to believe that a pilot with Steve's vast experience would even dare venture into this area at all without extensive familiarity with the terrain and some foreknowledge of a safe route through the valleys beforehand. I would speculate that he was complacent more with aircraft performance for the conditions in which he was flying. Aircraft accidents tend to be the result of a series of mistakes though, rather than any one single event. The NTSB report will obviously shed more light. Dave, get a grip. First, not every pilot is taught an Immelman Turn. No where in the PTS for a private or commercial pilot will you find a requirement to teach an Immelman. Second, the aircraft was a Bellanca Super Decathlon, which is a single engine, normally aspirated, 180HP aircraft. At 10,000' MSL, it will not have all kinds of performance. Although it has a service ceiling of 17,200', at 10,000' much of its performance and in a mountainous region where severe up and down drafts occur it's very possible it could not overcome such a situation. Third, he may not have filed a flight plan because he was going out for a short flight..happens all the time. Fourth, an ELT activates at an impact of 7g's, if he flew into the mountain head on, he certainly exceeded that, but he could have also destroyed it...or the battery simply may have been dead. Fifth, animals could have carried off his remains, clothing, etc, which would explain why it separated from him...and if you think weather and time don't get rid of hard items you may want to go look at the Grand Canyon. You say you've investigated many aircraft accidents...I'm hoping it wasn't for the NTSB or FAA. Speculating can be fun, and nearly impossible to avoid. The NTSB should eventually be able to determine his attitude and speed from the wreckage. His bones being scattered all over the place is not surprising. I have seen a dead horse's remains seemingly vanish in the middle of the Ocala National Forest in Florida from animal scavenging. Does anyone have the GPS coordinates of the crash site? This would be helpful to locate on Google Earth. Steve impacted here at around an altitude of about 10,000 ft. The valley Steve's plane flew into was in the shape of an upside down 'U' from the perspective of entering the valley from south-southeast, heading north-northwest. This area is also in close proximity to the long closed Minaret Mine. At Steve's aircraft's low altitude (relative to the surrounding terrain), the only way to have exited this small valley would have been to turn the plane around 180 degrees. Aircraft at higher altitudes have a substantially higher groundspeed relative to indicated airspeed than they do at sea level or other low altitudes. This results in a MUCH larger turning radius at a given indicated airspeed at higher altitudes. A pilot unwittingly trapped in a boxed valley in this extremely dire situation may have only two choices: 1) stall the aircraft at a high bank angle in a vain attempt to avoid terrain or 2) impact surrounding terrain at high speed. Neither choice is very appealing or particularly conducive to life, unfortunately. Upon studying the approximate crash site coordinates (which I didn't have when I posted earlier), I would now have to agree with Miles O'Brien's original assessment as to what happened. I believe the final NTSB report will read somewhere along the lines of 'inadvertent controlled flight into terrain as a result of improper flight planning by the pilot in command.' Contributing factors to include the pilot's inexperience in the aircraft type and the pilot's inexperience in flying at low level in local terrain conditions. What is the relative relation of the place where the plane was found to the place where the searching was concentrated? I have not seen this explained in any media. Was the crash within the primary search area? Or how many miles away, and in what direction? Thank you CNN for choosing a reporter with the qualifications to write 'I flew my small plane to the Minden, Nevada'. I get so tired of idiot reporters who don't know an elevator from an aileron insisting that something is sinister because there's no google maps style push pin above the crash site. Single engine aeroplane, an invitation to the grim reaper, lurking in a dead end valley. In a single engine car, cutting in front while turning, scary enough. Feelings are mixed. Glad and sad for the widow. Also extremely fascinating to read about all the ands, ifs or buts attached to this accident. Reading a blog such as this really helps people without knowledge of such a subject gain a much better perspective. 1. Why did Steve Fossett leave his beacon sending watch at home? (he always wore it). 2. How did his wife obtain a judgment declaring Fossett dead less than one year after he disappeared? Typically it takes years. declaration of death? The only reason would be for life insurance proceeds. Why would she need funds right away if they were "millionaires?" Has anyone looked into the state of his finances? the risks of smacking into a mountain. Was the airplane capable of instrument flying? 4. I have nothing against Fossett, and admire him, but something is off. For al the sensation, might as well complete the investigation. Forsenic psychiatrist, forsenic accountant, public and private detectives. Bad batch of plane fuel, clogged filter, bee flew into his mouth ? Tired, stressed out, bad health, any cause for inattentiveness ? Accidents happen, even without carelessness. Nothing is off Sara, "low level" instrument flight in an 8-KCAB, in mountainous terrain in marginal wx, nearly impossible... Sh$$ happens Sara... even the best pilot can get in trouble in this kind of situation. This airplane would have little left at 10K as compaired to sea level, the terrain is steep... Steve had one of the best lifes anyone can imagine. He had an accident, we all have accidents, no matter how good, no matter how lucky... Accidents happen, end of story. As I recall, during the first week of the search when Mr. Fossett was missing, there were some days when an aerial search was not possible by all aircraft because of severe winds. I don't know if the winds in the area on the day of his flight were as strong as on the days that followed, but any wind of any significance can make a flight in mountainous terrain very challenging, especially in a small airplane. The Bellanca 8KCAB he was flying had a 180HP engine that is capable of 1280 feet per minute climb rate at SEA LEVEL. It's service ceiling (the maximum altitude it is capable of reaching) is 15,800 feet under ideal conditions. As you climb higher, the climb performance capabilities of an airplane is diminished with increasing altitude. Winds shoot up the face of a mountain and roll down the backside and can produce down drafts that far exceeds the climb capabilities of the aircraft. I've never flown a Bellanca 8KCAB like he was flying, but I have flown similar 180 HP aircraft in mountains in moderate wind conditions and have experienced 1,000 to 2,000 feet per minute down drafts that certainly exceeded the climb performance of the aircraft I was flying at the altitude I was flying, Throw in a little moderate turbulence and you've got your hands full. The best insurance in these conditions is at least a couple thousand feet of altitude above the highest peaks you are flying over. At 10,000 feet, the climb performance of his aircraft would have been greatly reduced and at best probably capable of no more than 400 to 500 feet per minute climb rate. Thunderstorms can produce updrafts and down drafts far in excess of normal clear air wind. I understand the authorities are researching to determine if there were any thunderstorms in the area on the day of his flight that may have been a contributing factor in the accident. Box canyons in mountains are a bad place to be in a small aircraft under any weather conditions, because you may not have enough room between the canyon walls to execute a turn to reverse your route and avoid hitting sudden up sloping terrain or enough power to climb over it, and it appears by the estimated GPS coordinates of the accident site that the accident probably occurred in a box canyon at about 10,000 feet altitude. The crash site is approximately 75 miles from the airport he took off from and his cruise speed would have been about 120 mph, 35 minutes as the crow flies. He was reported to have had 40 gallons of fuel on board and with a burn rate of 8 gallons per hour, he could have flown 4+ hours, so running out of fuel was probably not a factor in the accident. The purpose of his flight was reported to be to find an area with enough room to attempt his land speed record, a valley floor. The area of his crash certainly did not have any of the attributes of such a place, so why was he there? My guess is that bad weather moved in and forced him into the mountains to try to get around it and back home. With his experience, I don't think he would have been sightseeing in a box canyon far up into the mountains where the performance of his aircraft would have been compromised. Unless a wing or other major component of the aircraft is found a significant distance from the impact site, we'll probably never know exactly what caused the accident, only that we lost a hero. I'm glad that they finally found some answers. Has anyone followed up on the other undiscovered aircraft wrecks found during the search for Mr Fossett? I would like to see Miles O’Brien and Charles Branson finish Steve's "Deep space Challenger" Project. All you have to do Miles is fly it. We, the museums of the past, just become dust. He was newsworthy, but dust, is also is the result, of those who are not. As long as everyone is speculating, don't forget to include structural or mechanical faliure along with heart attacks, rotors and aliens. Rumor is that this particular plane was a piece of junk, treated carelessly as a toy , ridden hard and put away wet–in stark contrast to the high end jets that guests rode to the Flying M. We'll never know, unless the engine wasn't making power at impact or a wing or the tail feathers are found miles away from the main crash site. The latter seems unlikely if the angle of impact was horizontal, as the sheriff says it appeared to be. In any case, the logs will be impeccable. Rest In Peace. From an article in Esquire magazine, "Just before Fossett took off, Hilton’s staff pilot, a guy named Mike Gilles, carefully went over the preflight and landing procedures with him. As Gilles explained later, Steve Fossett was “not a stick-and-rudder man” and “could get in over his head” in this type of aircraft." This is very telling, there are also certain skills in flying low and slow in mountaineous locations that not every pilot posseses, even accomplished pilots, especially in unfamiliar a/c and terrain. Also there is possibly a witness who has stated they were in Yosemite the day of the accident and saw a light a/c flying too low and with engine problems sounding like the engine was missing. Witnesses in aviation have often proven unreliable, but perhaps this one is accurate. Also, the Fossett family was very involved with Yosemite and the Sierra Club to the extent that Steve Fossett's dad would lead groups for the Sierra Club's outings and excursions. Steve had countless trips to Yosemite and would have had favorite places there, perhaps that is why he was flying low in those particular canyons and mountain ranges, he might have been revisiting, from the air, special spots in the Park. That is exactly what I would be doing if I were he, since my parents considered Yosemite as sacred ground, and there are certain areas I would make a point of flying over, as low as saftey would allow. Whether it was spatial disorientation, not knowing how to fly in the mountains, not looking for a downhill way out in the canyons, downdraft rotors, whether he was flying behind the plane-in abilities, had a medical problem, or whether he had an mx issue or engine out, we don't know, it was probably cumilative, as miles and erin here have aptly pointed out. There are pics of one of the props that survived the impact intact. It is not completely bent up at the tip, just slightly curved, which is telling too. 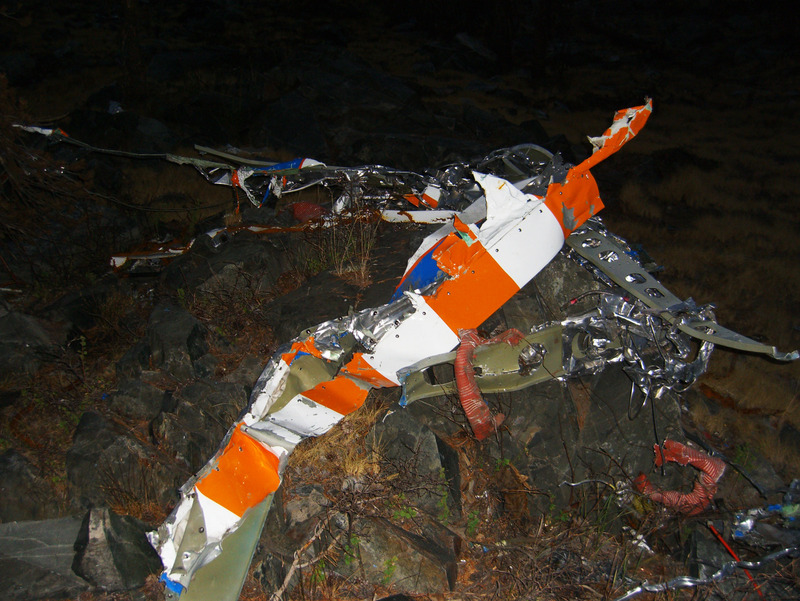 The picture of the prop blade is telling, especially in light of the following from the NTSB's report: "The airplane was involved in a landing incident on May 27, 2007. During this event, the airplane departed the runway during landing roll and impacted a barbed wire fence. An engine sudden stoppage examination was performed and a new constant speed propeller was installed on the airplane." Recent prop strike + lack of tortional damage to the prop blade suggests that the engine wasn't making power at impact. At this point, it won't be a surprise if they find a broken or siezed crankshaft inside that engine. I wonder if the other prop blade was found. Engine failure also fits with the crash trajectory. It looks like he was trying to land–relatively flat trajectory, paint scars (striations) showing a nose-up, wings-level attitude, the long debris path. IF it turns out that this was a forced landing gone horribly wrong, his reputation as a competent pilot should be fully restored. There are few places to put down in those mountains where the odds of survival are better than a crap shoot. For starters I know the results aren't in yet on the dna at the crash site. But I have tried repeatedly to tell anyone the coordinates where I found what I think is a person! Last year I downloaded the amazon/turk imagery for use on google earth to start my own little search. I do not claim to be psychic but I located a person near the flying m ranch standing by 6 rocks forming a half circle along with some blue coveralls laying on a rock they were forming an H this was two days after he disappeared in two day old imagery! And also nearby I found some scrape marks on a hill it looks like something tried to touch down. Like I said before I don't claim to be psychic but I had only located all of these (I have coordinates for all) while I was in contact with whom I believed was Steve! He told me some pretty interesting things all related to his disappearance. For starters he said he flew near the ranch to try and signal for help which didn't work. The Aileron was jammed but the rudder worked he said he couldn't bring the plane down and it would only go left! He said he attempted to try and bring it down on a slight hill it touched down and bounced up and started to fly back up so he bailed out. He was injured in the attempt and he said he watched as his only means of return took off and banked to the south. The one thing that threw me off was he threw a big fit about his wallet and said everything he had was on that plane including his coat. I didn't realize any of this was important until they located the wreckage however I tried repeatedly to contact anybody in hopes they would look into the coordinates I had sent them although I should have given them the details I knew I didn't think it mattered. It didn't help though perhaps it was too unbelievable for me to claim I found him! I told him to remain there though but the next day he left the area and told me he was almost attacked by what he said was a wild dog. I asked if he meant coyotes but he insisted he knew the difference and that they looked more like dogs. He eventually returned to the area after I told him I probably wouldn't be able to relocate him in later imagery. During then next contact he said he left again because he was attacked by one of the dog's he said he was walking south. I asked why south and not east like I told him and he said they were steering him in that direction and it wasn't just one it was several. I tried to reassure him that help was on the way and he said he hoped it would get there soon because he didn't know if he could make it another day. He said his hand was all tore up from the attack and he lost the stick he used to fend himself from the animal that attacked. He said he was cold and losing blood badly he told me he found a spot kind of like a crevice with a large rock that his back was against. The next day I couldn't contact him it wasn't until two days later that he finally answered back and told me he was no longer alive. And just recently I re-downloaded the dg-3 images to see if I could find his body and I located something but will not tell just anyone those coordinates! This has had me stressed waiting on the dna results and has even affected my health making it worse. I would hope at least that somebody working at the ranch will contact me for the coordinates of my latest search! I won't list the details of the image or the coordinates but I will say it looks very very promising! Will somebody please listen??? This is beginning to affect me personally!!! What will it hurt to check one location about 2 miles from the ranch? I realize anybody can be wrong about anything and I am willing to accept defeat if that is the case. Please this is no joke or laughing matter!! I am dead serious and it is killing me to know this without telling somebody!! ok i will bite so how did he contact you?????? also why did you NOT print off the pics??? then send them or at the very least have something to show someone!!!!!!!!! How can anyone check the coords when you don't display them and how can they contact you for the coords, when you don't give a contact adress? IT service management or IT service support management (ITSM or ITSSM) refers to the implementation and management of quality IT services that meet the needs of the business. IT service management is performed by IT service providers through an appropriate mix of people, process and information technology. ;,;..